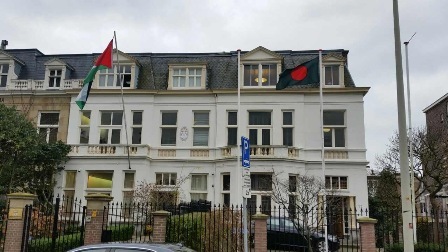 07 March 2018, The Hague: The Embassy of Bangladesh, ​​The Hague organized a discussion meeting to discuss the significance of the historic speech of the Father of the Nation Bangabandhu Sheikh Mujibur Rahman on March 7, 1971. Apart from the Embassy officials, about 30 expatriate Bangladesh nationals attended the discussion meeting. The Bangladesh Ambassador to the Netherlands and the Leaders of Holland Awami-League participated in the discussion on the background of the historic speech of 7 March 1971 and its impact in the glorious liberation war. At the outset, Embassy officials recited the message of the Hon’ble President and the Hon’ble Prime Minister of Bangladesh issued on the occasion. In the Programme, among Holland Awami-League leaders- Mr. Alauddin Mollah, Mr. Jashim Uddin, Mr. Zoynal Abedin, Mr. Murad Khan, Mr. Imran Hossain and Freedom Fighter Mr. Maeed Faruk delivered their remarks. Holland Awami League leaders in their speech highlighted the distinguishing leadership of Father of the Nation Bangabandhu Sheikh Mujibur Rahman, outstanding self-sacrifice he made, his prudent vision, courage, progressive attitude, patriotism, humane quality, etc. They discussed the background of the historic speech of 7 March 1971 and how it ultimately contributed to the liberation war. H.E. Ambassador of Bangladesh to the Netherlands, Mr. Sheikh Mohammed Belal described the historic speech of Father of the Nation Bangabandhu Sheikh Mujibur Rahman on 7 March 1971 as the certificate of freedom of the Bangali nation. 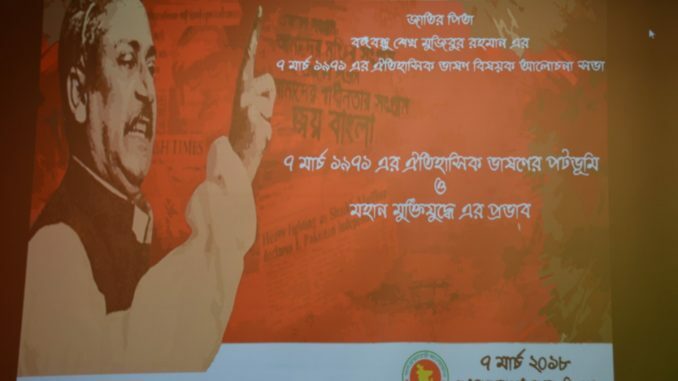 He mentioned that the speech presented by Bangabandhu 47 years ago did not only lead the Bangali people during the liberation war, but this speech has recently emerged as a unique documentary heritage of the world. The UNESCO’s recognition of the historic 7 March 1971 speech of the Father of the Nation Bangabandhu Sheikh Mujibur Rahman as part of the world’s documentary heritage has brought a rare honour for all of us. In that historic speech of 1971, the persecution of the of the Pakistani ruling party was mentioned on one hand, and on the other hand the speech contained direction for the whole Bangali nation. Ignoring all sort of hindrances, millions of Bangali people came to that public meeting of 7 March 1971 only to listen to his leadership visionary. This historic speech served as a proven force for all during the liberation war. Therefore, this speech has immense contribution in our glorious liberation war. Ambassador Belal also mentioned that in our effort to inform Dutch people the significance of this historic speech, with the help of few expatriate Bangladesh nationals Embassy of Bangladesh took the initiative to translate the speech into Dutch. A translated copy of this historic speech was distributed at the end of the ceremony. Finally, expatriate Bangladesh community thanked the Embassy for organizing the discussion meeting on historic speech of 7 March 1971 and the initiative to translate the speech in Dutch language. The programme ended with serving traditional Bangladeshi snacks.